CLA continued to provide California’s public libraries with summer reading resources free of charge through the California Summer Reading Program. Resources include: program manuals, professionally-designed graphics, and access to high-quality, low-cost, theme-based incentives. To help libraries make the most of their summer reading materials, we also maintained a resource-rich website, presented a training workshop that was later made available for viewing online, and worked with program sponsors LEGOLAND, Round Table Pizza, and Togo’s, to provide coupons for libraries to use as incentives. We also facilitated California participation in the nationwide Teen Video Challenge, which invites teens to create summer reading PSAs, and we coordinated a statewide, multi-library summer activity, Armchair Travelers, which paired up 54 libraries in different parts of the state, as pen pals. 20,881 events and activities took place and were attended by 967,143 patrons. As part of CLA’s Five Book Summer Challenge, 42 library jurisdictions reported that 93,744 children and teens read five or more books during the summer. We know that reading just five books during the summer can help prevent learning loss and therefore we can anticipate that these students returned to school in fall 2011 having retained skills and knowledge from the previous year. 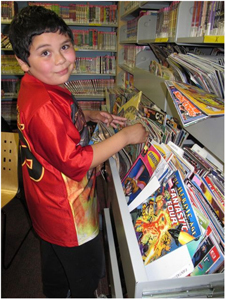 Libraries’ outcomes-based evaluation data demonstrated that summer reading participants feel part of a community of readers and library users—positive results that suggest that these patrons will experience all the benefits that reading and library use confer. Summer reading participants reported that they enjoyed the summer reading program; they like to share and talk about books; and they view the library as a friendly place where they can find books to read. In addition, 1,064 previously-underserved community members participated in summer reading as a result of outreach efforts those libraries that presented outcomes-based summer reading. These new summer reading participants included migrant children, teens in a residential drug facility, and Food Bank recipients. 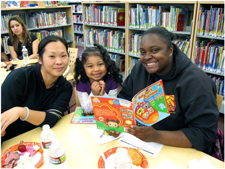 The California Summer Reading Program is guided by an advisory council of California librarians. 2011-2012 council members are: Joanna Axelrod, Escondido Public Library; Lori Easterwood, Sacramento Public Library; Helen Fisher (chair) Ontario City Library; Anna Hartman, San Diego County Library; Jennifer Lawson, San Diego County Library; Mathew Rose, County of Los Angeles Public Library; Courtney Saldana, Ontario City Library; Susan Serrano, Butte County Library; Barbara Sutton, San Diego County Library; Sarah Hoff Vantrease, Los Angeles Public Library. 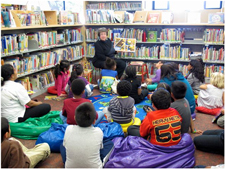 The California Summer Reading Program is a project of the California Library Association, supported in whole or in part by the U.S. Institute of Museum and Library Services under the provisions of the Library Services and Technology Act, administered in California by the State Librarian.